I published the New York & New Jersey Subway Map as a proof-of-concept to demonstrate how a single map could give people a comprehensive, harmonized view of the transit options available throughout the region. 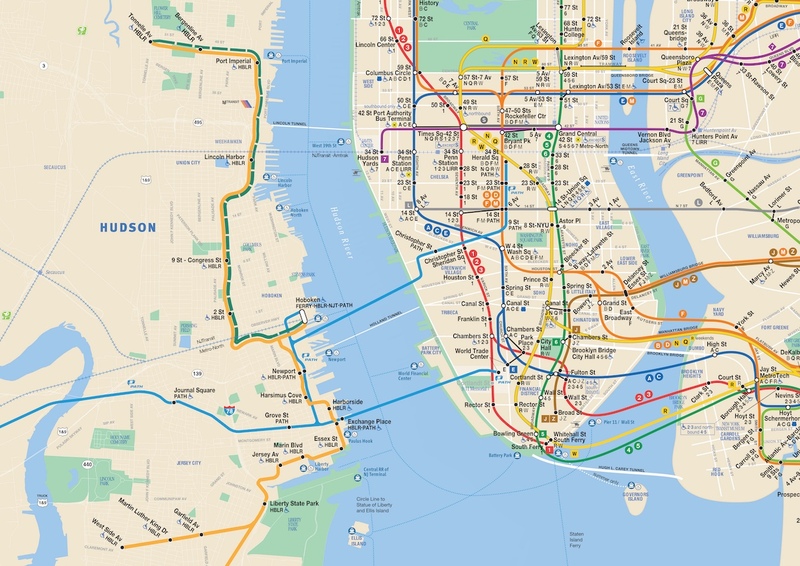 It is based on the design of the New York City Subway Map, one of the most recognizable transit wayfinding tools in the world, and incorporates subway, light rail, regional and intercity rail, and ferry services. Tens of thousands of riders now use the New York & New Jersey Subway Map to help them navigate the NYC metro area. The New York & New Jersey Subway Map includes transit services that connect the growing urban population just across the Hudson River. The precedent for thinking about the New York & New Jersey region in a unified way parallels its rise as an economic and transportation hub in the early 20th century. In its 1917 ruling in the New York Harbor case, the Interstate Commerce Commission declared, “Historically, geographically, and commercially New York and the industrial district in the northern part of the state of New Jersey constitute a single community.” The ICC’s decision spurred the creation of an independent government entity in 1921 to replace the fractious rule of the private railroads over the port district. A century later, the Port Authority of New York & New Jersey also operates the region’s airports, bus terminals, bridges & tunnels crossing state lines, and the Port Authority Trans-Hudson (PATH) subway connecting New York & New Jersey. 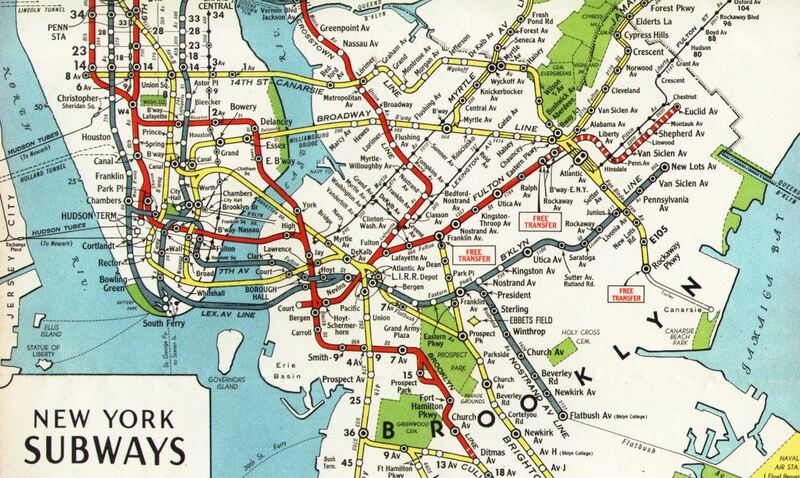 The subway maps created to help people navigate the new transit systems built throughout New York City included the Hudson Waterfront and transit connections between New York and New Jersey. 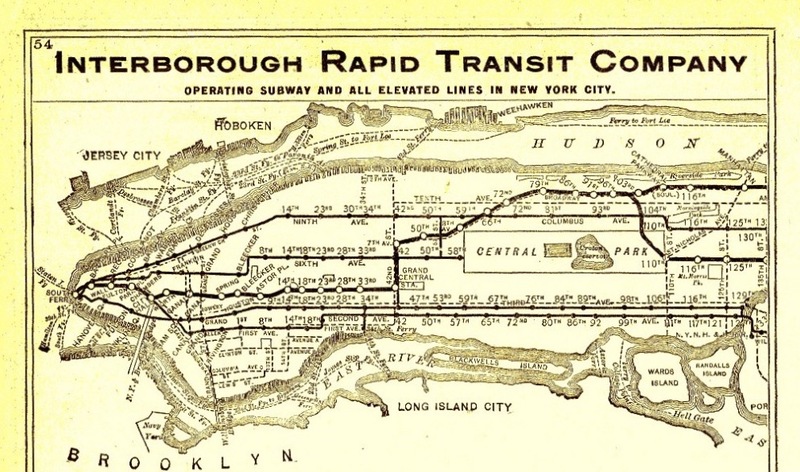 Although the Hudson & Manhattan railroad (the precursor to PATH) was still under construction and revenue service wouldn’t begin until 1908, the 1906 Interborough Rapid Transit (IRT) map showed the New Jersey waterfront, with Hoboken and Jersey City labeled, and ferry routes connecting NY & NJ. After the IRT, BMT, and Independent Subway System (IND) were consolidated into a single system, the 1944 NYC Board of Transportation map included the Jersey City waterfront, with the H&M lines labeled “Hudson Tubes (to Newark)”, the system’s stations in Manhattan, and Exchange Place station in New Jersey. 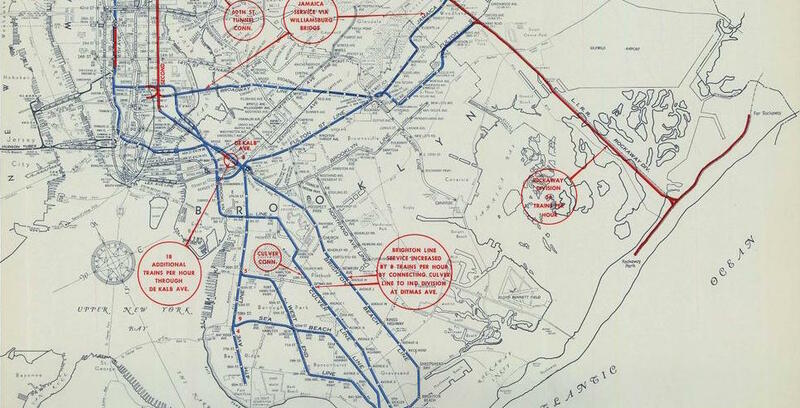 This 1950 NYC Board of Transportation map shows the Hudson & Manhattan railroad and New Jersey waterfront in much the same way as the proposed New York & New Jersey Subway Map. The “Subway Map” is not “just the subways”, but an opportunity to provide a means for telling folks how to get about the city. In recent years the MAP has called it, “The Map”. 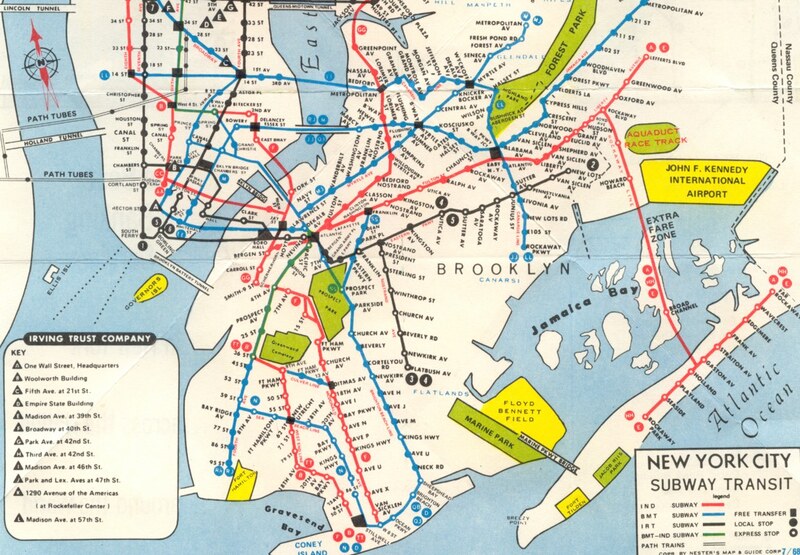 In any case, the “subway map” has for decades been a well used representation of the city. It provides a means for folks to try and figure out where they are, and where they want to go. Which of course has lead to countless arguments about what to include, how to include it or depict it, what not to include, etc. Inside the Transit Museum there are displays about how the “subway map” has changed over the decades. This particular argument is about how to include and depict the PATH system. On one level it is really not that far removed from arguments in the past about what should or should not appear on the maps. Anyone remember past subway maps where only a particular company’s routes were shown on “their maps”- the IND only maps, the IRT only maps, the BMT only maps? Anyone remember the complaints over the shape of Central Park in previous maps? 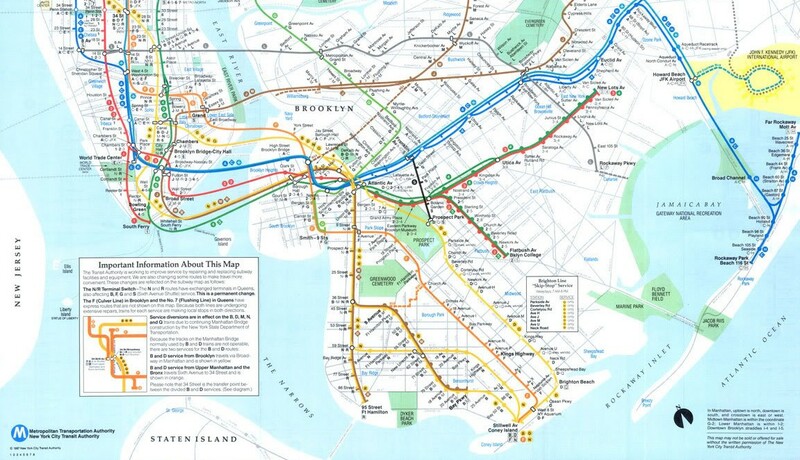 The MAP is not just about the subway, but about the ability to help folks navigate their way around the city. 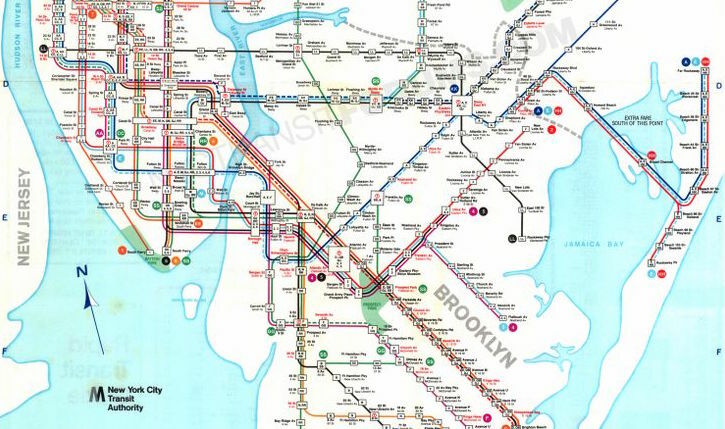 Transit maps like the New York City Subway Map are more than just way-finding tools; they become cultural assets that frame how people see the city. Over 5 million people ride the subway on weekdays, and New York City received over 58 million visitors in 2012, which means the Subway Map is one of the most widely recognized public transit maps in the world. Including PATH on the Subway Map in a manner that better reflects its role as New York’s “second subway” would improve awareness of cross-Hudson rapid transit among the largest audience of transit riders in the New York area, supports greater transit use and economic activity on both sides of the Hudson, and acknowledges the economic, cultural, and geographic ties between Manhattan and the area of Hudson County that has been described as New York City’s “sixth borough”.